Members of the Fayetteville Rotary Club presented the Fayetteville Police Department with a $1,000.00 check today to support the annual Junior Police Academy. Each year, for the past eight years the police department has hosted the Junior Police Academy during the summer. Students from the eighth grade through the tenth grade participate in a week of fun activities, physical fitness and learning about police work. Students will be taught topics such as crime scene investigation, conflict resolution, traffic stops, canine and team building. 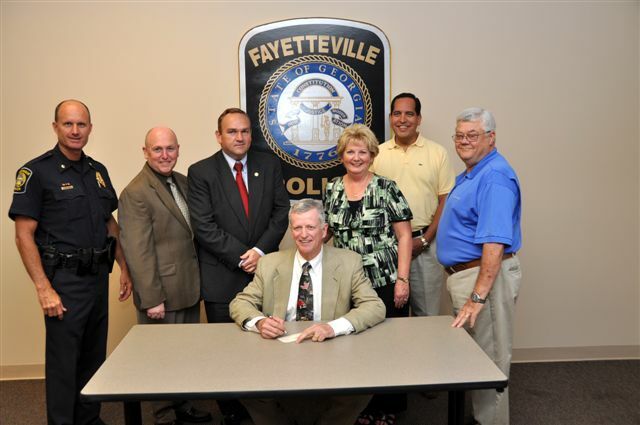 “We are very excited about the Fayetteville Rotary Club becoming a sponsor for the JuniorPoliceAcademy for the next three years”, said Lieutenant Debbie Chambers, who oversees the program. Each year the police department has depended on the generosity of our citizens and businesses to host this very valuable program. The Fayetteville Police Department thanks the Fayette Rotary Club for their commitment to the police department as well as the children in our community. The above article can be found at www.fayetteville-ga.gov under Latest City Announcements.